Your backyard is your own little piece of the outdoors. How you decorate your slice of paradise can have a big effect on how much you enjoy your time spent outside. These 10 cool things you need to have in your backyard will make the exterior of your home a place that you, and your family and friends, will never want to leave. A summer kitchen does more than help you spend more time outside in the warmest months of the year — it helps keep the interior of your home spick and span when you throw outdoor parties. Include a refrigerator, grill, cabinetry, and plenty of counter space to ensure that you don’t have to perform tasks inside while your friends and family are enjoying the outdoors. Forget about fighting over the hammock on every beautiful day. An extra-large hammock makes it possible for your family to relax in the shade together. There are a wide selection of jumbo hammocks available, ranging from those that fit two people to those that can hold more than 1,000 pounds of weight. Cramming onto the couch to watch a movie is now a thing of the past. 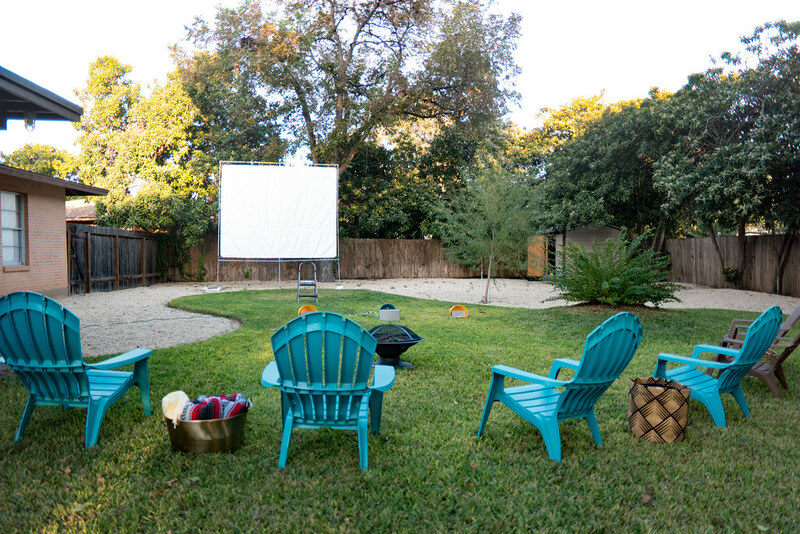 You can now invite all of your family and friends over to watch a movie together on your jumbo outdoor projector screen. Don’t forget to supply plenty of lawn chairs for everyone to enjoy the show. Turn your backyard into a tropical paradise with a sheltered reading nook that you can enjoy in all types of weather. Pack the nook with plenty of pillows or comfortable reading chairs to inspire everyone to spend more time with their books. It’s hard not to want to spend more time together when you have comfortable wooden swings dangling the perfect length from the warmth of the fire. Fire pit swings ensure no one is forced to sit on dirty logs or in uncomfortable lawn chairs during gatherings around the pit. Even better, you can use this awesome backyard feature in all seasons. What’s better than growing up with a trampoline in your backyard? Growing up with an in-ground trampoline in your backyard. The in-ground trampoline makes it easy to hop onto and off of the trampoline and eliminates injuries associated with falling several feet off the side. You don’t have to live near the ocean to enjoy an outdoor shower; although, you’ll love being able to rinse the salt away if you do. An outdoor shower is ideal for rinsing off after long summer days playing outside in the grass or the pool. Opt for a waterfall shower head and surrounding tropical plants to make your outdoor shower feel like a special oasis. Swing sets have gotten far more elaborate in recent years, and many don’t require you to be a kid to have some fun. Choose a play set with a full climbing wall, zip line, rope ladder, or other features to turn your backyard into an action-packed obstacle course. You don’t have to live in the mountains to enjoy the luxury of a stream flowing through your backyard. There are a number of websites available to help you build a do-it-yourself backyard stream with your own water supply and items you can find at most hardware stores. When the stream is finished, you’ll enjoy the benefits of a more scenic backyard atmosphere and the soothing sound of flowing water. Cocoon hanging chairs are some of the coolest places you can hang out. These hanging swings are designed for children and adults, providing shade and a comfortable place to relax outdoors. Their nest-like appearance is fun for kids playing or adults lounging, and the compact design of some models means you can take your chair out of your backyard and use it for other outdoor adventures like beach vacations and camping excursions.